Stunning photo by Dana Edelson of the band performing Ultraviolet for Saturday Night Live last night. As well as Breathe, Moment of Surrender and Ultraviolet for the TV audience, the band slipped in With Or Without you for the studio audience. Did you catch the show? Tell us what you thought. I did see yesterday performance of U2 i love it, i can't wait to the Rose Bowl Concert, is going to be soo huge that concert, awesome jacket of red laser perfect for the song of Ultraviolet (light my way) and the hanging mic, great, too bad that they cut it in the tv the song, but well, im ready for this Octuber 25th in GA section yeahhhh!!!!! Cheers everybody and hey kinglerxt add me as a friend. When they played Moment of Surrender I was kind of caught of guard. I didn't expect them to play a seven minute song that isn't a single from the album., but when Bono put his heart and soul into the lyrics and started to freestyle I was amazed. This was the best version of this song I have ever listened too. I am really hoping they put this show on sale as an EP. U2 was great last night on SNL. After having seen them at Giants Stadium on Thursday, I felt like I was reliving some wonderful moments. The painfully cut off Ultraviolet was a great touch. Maybe if us U2 fans are lucky Hulu will show the full version of the song! fabulolous..but it got cut off! SNL is not the venue I would have gone with, the show has seen better days frankly and is simply not funny. U2 should not have stooped to such a low level for exposure. I just thought it looked bad. A great appetizer for the DC show on Tuesday. Thank you for playing Ultraviolet - AMAZING! Another vote for posting the full performance to overcome NBC's stupidity. Wish they could have had the full version of Ultra on here or at least SNL web site. . .would have been great to see it. It just makes me sad that Chicago show has come and gone. I wish I had the money and time to see them again. I saw 3 songs and they were fantastic! Edge was all over his guitar like he was on fire. Bono was soooo charged up! I am really enjoying seeing Larry singing again and Adam is out of his shell and having fun being the rock star he is. They all are confident with their songs and how they are playing live - which is amazing to watch and listen! 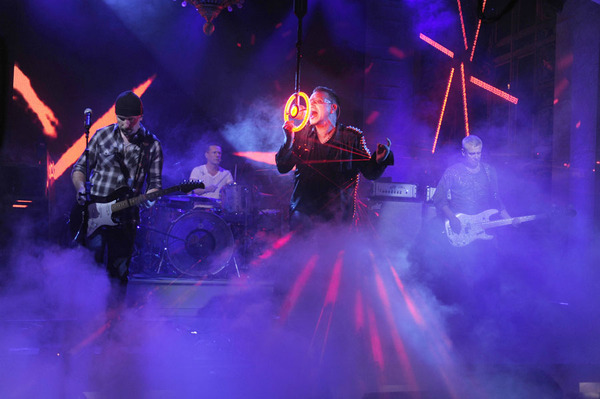 I absolutely loved Ultraviolet performance on SNL last night, I am so excited to see U2 in Tampa. I have shielded myself from some of the news so I can be there to experience it without any preconceived notions, but the idea that they will be playing my favorite song of all time (Ultraviolet (light my way), just makes me want to explode with excitement!!! never have I ever heard a musical guest play a third song on Saturday Night Live. It was a nice gift. I loved U2 on SNL. They were the highlight of the show. They give all the new bands a run for their money. The energy in this band is so up lifting. Bono is such a showman. I watch to see Adam. He is my favorite. Does he know he is a rock star. You can't tell it, he is so cool and calm. Loved the show. It was worth staying up for. I cannot believe that a show like SNL, which is struggling, cuts away from U2 performing Ultraviolet! They did it the last time U2 performed All Because of You back in 2005. One would think they would milk the most entertaining part of the show - just don't get it! Wish they would have done "Crazy" or "Magnificent". The best performance of Moment of Surrender I've herd. Brilliant! Nailed Breathe as well. Trust NBC to cut halfway through Ultraviolet! Poor decision guys. Wish I'd been in the audience. What a shame that NBC cut Ultraviolet way too early!! This is my favorite song on the tour! Is there any chance of seeing the entire video on this site???? This has been my favorite song on the tour!!!! I wish it wasn't cut short last night~!!!!! 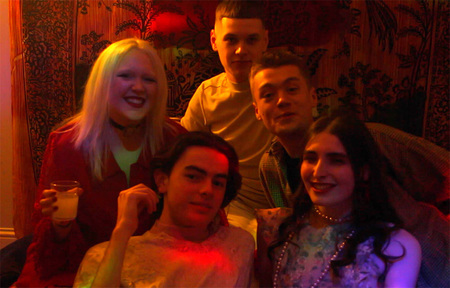 Any chance of having the complete version posted on this site??? BAD NBC!!!!!!!!!!!!! SNL was great, Can't wait until Tuesday!!!! Still in disbelief that Ultraviolet was cutoff by the closing credits, what a showstopper performance by U2...without equals. Bono was so alive on SNL!! You could tell he was lovin it!! Saw the show in Dublin, and the encore was amazing! Laser Jacket and drop-down mic were way cool!! A stunning performance. I was amused at the thought however, that Bono was going to crash into The Edge or Larry when swinging on the "Ultraviolet" mic on the small stage. Even though it was cut off by NBC, I enjoyed seeing them perform Ultraviolet (Light My Way). That song was my "hands down" favorite moment last Sunday at Gillette! Who ever came up with the concept is a freakin GENIUS! It still gives me chills when I think about Bono swinging on the mic... AWESOME! Worth staying up way past my bedtime for! But it made me sad that my shows in Toronto are over . . . c'mon 2010 NA leg! Kudos for not playing it safe!! MOS was absolutely stunning, wasn't expecting what is soon becoming one of my all time favorite U2 songs to be played on national TV. Too bad Ultraviolet was cut. I would have preferred to hear the complete song rather than sit through another excruciatingly bad "comedy" skit. … on the first two downloads from the upcoming special live set for subscribers. Subscribers Special. 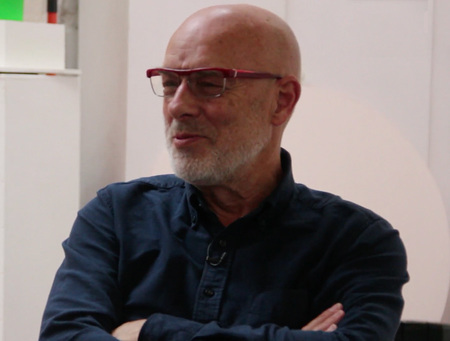 Brian Eno on how U2 have remained a cutting edge band. Remastered, new remixes, double vinyl. No Line On The Horizon at ten. Pre-Order Today.